Plans for a new, 87-bedroom, £6.6million hotel which is set to positively transform the economy and job prospects of seaside town, Portrush, have been backed by six leading business organisations and local businesses. The Federation of Small Business (FSB), Hospitality Ulster, Northern Ireland Hotels Federation, Retail NI, Ulster Stores Limited and the Causeway Chamber of Commerce, have lent their unanimous support to the development and have each made written appeals in a bid to encourage Councillors to decide to allow the development to pass the planning stage. 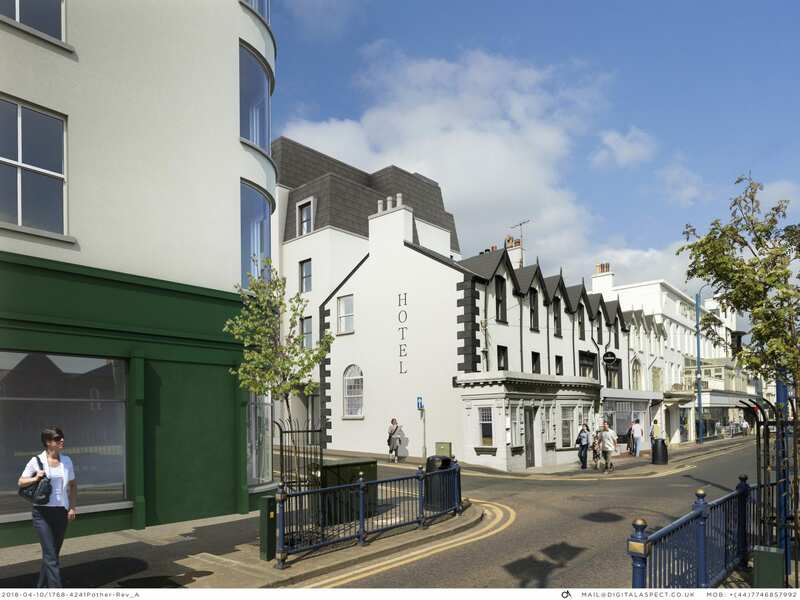 The plans for the hotel on the site of the former Londonderry Hotel in Portrush have been submitted by Andras Hotels who, following feedback from the local community and since the building was listed to B1 standard, have dramatically revised the proposals to ensure that the hotel will reflect and contribute to the vibrancy of the town. They are being considered by Causeway Coast and Glens Planning Committee on Wednesday 23 January. If approved, the project will regenerate the area and will contribute an estimated £1.4million each year to the local economy, which will create 48 jobs during the construction phase, adding a further £4.8million to the Causeway Coast and Glens area and an additional 41 new jobs when the hotel opens. The project will attract a further 6,600 visitors to the North Coast per annum. Rajesh Rana, Director, Andras Hotels hopes that the local Councillors will make their decision based on the long-term economic benefits the new proposed development will bring, he explains: “We have worked extremely hard to develop the plans to allow the refurbishment and restoration of two important listed buildings on Main Street – the Londonderry Hotel and the former Northern Bank across the road. These two projects will dramatically improve the economy of this wonderful seaside town. “We are committed to retaining the history of the site and important architectural features which will be preserved along with artefacts, pictures and stories. “The hotel concept will reflect the heritage of this important site and will retain and preserve the historic features. “The two beautiful mosaics featuring the previous names of Black & Sons and the Londonderry Hotel will be kept and refurbished, and the interior design scheme will retain the Atlantic Bar entrance screen. “World-class interior designers have been appointed who have prepared fantastic proposals for the reuse of the buildings facing Main Street and to celebrate the heritage of the town in the most unique and celebratory way. “The interiors will reflect the history of these buildings as well as the unique transition of the Portrush setting, from Victorian seaside resort, to the coastal heritage and global golf appeal. “If approved, we intend to start work on the hotel in 2019 and open our doors to visitors by the start of 2021. “We have examined alternative options, but a viability assessment was carried out on the existing building which found that it cannot be brought into economic use if fully retained. A reduced scale option has also been rigorously tested which shows that this would not be viable, nor would it deliver the tourism benefits to the town. The application has been recommended for refusal in part due to concerns raised by Historical Environment Division. The plans submitted will see the important front terraces retained, refurbished and enhanced while the rear parts of the site will be redeveloped to provide new build construction which will host the majority of the bedrooms and public areas on ground floor. The revised plans for the new proposed hotel are being considered by Causeway Coast and Glens Planning Committee on Wednesday 23 January 2019.